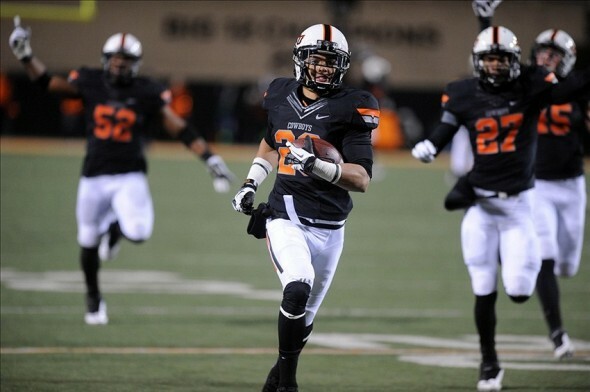 Tyler Patmon recovered a fumble and raced 78 yards for a touchdown against Oklahoma State. For the second week in a row, the Oklahoma State Cowboys played in a game against the top team in the Big 12. Last week, they knocked off the Texas Longhorns and this week they hosted the Baylor Bears. The Bears were unbeaten, ranked #4 the country and averaged over 61 points per game. Baylor QB Bryce Petty has kept the recent tradition of great quarterbacks alive in Waco. With a win over Oklahoma State, Petty would be in the conversation for the Heisman Trophy. After beating Texas, the Cowboys win streak was increased to 6 games and 5-0 since senior quarterback Clint Chelf took over as the starter. The change at quarterback has made Oklahoma State very hard to defend. Chelf has played well and has been a threat both on the ground and through the air. The Cowboys defense has also played well, holding Big 12 opponents to 20 points per game. Baylor was coming off two big wins at home against Oklahoma and Texas Tech, however, the injuries were starting to take a toll. In the last two weeks, they had lost their leading receiver (Tevin Reese), their top two rushers (Glasco Martin and Lache Seastrunk) and their starting left tackle (Spencer Drango). The game against the Cowboys would be a big test of their depth. Baylor was held to a punt on their first possession. On the Cowboys first possession they moved the ball to the Baylor 47 yard line, where they went for it on 4th down. Junior running back Desmond Roland was stopped short of the first down marker and Baylor got the ball in good field position. A 27 yard run by senior quarterback Bryce Petty put the ball at the Oklahoma State 1 yard line. The Cowboys defense, however, stood strong and forced a turnover when junior defensive tackle James Castleman swatted the ball out of running back Shock Linwood’s hands as he tried to extend the ball over the goal line. Castleman then fell on the ball, giving his team the ball at their own 1 yard line. The Cowboys came out attacking as the first two plays after the turnover were a 28 yard pass from Chelf to receiver Charlie Moore and then a 51 yard pass to receiver Marcell Ateman. The two passes gave the Cowboys the ball at the Bear 20 yard line. Five plays later, fullback Kye Staley ran it in from 2 yards out to give the Cowboys a 7-0 lead. Midway through the 2nd quarter, the Cowboys struck again. Chelf moved his team 80 yards in just 5 plays. The drive started with a 37 yard pass from Chelf to freshman receiver Jhajuan Seales. Two plays later, Chelf hit receiver Brandon Shepherd for 20 yards to the Bears 12 yard line. Chelf finished off the drive with a 12 yard pass to Charlie Moore to make the score 14-0. With 1:16 left in the half, the Bears finally got some momentum. Petty completed a 53 yard pass to receiver Clay Fuller to give them the ball on the Cowboys 30 yard line. The Cowboys defense stiffened and forced Baylor to settle for a field goal to cut the Cowboys lead to 14-3 at the half. Oklahoma State received the 2nd half kickoff and struck quickly. On the fourth play from scrimmage, Chelf hit Tracy Moore for a 56 yard touchdown and the Cowboys now had a 21-3 lead. On the Bears next drive they moved the ball to the Oklahoma State 25 yard line, but on 4th down, Linwood was stopped short of the first down. After taking over on downs, the Cowboys went 80 yards in just 6 plays. The two big plays were a 27 yard pass from Chelf to Charlie Moore and then they unleashed a trick play. Receiver Josh Stewart took a handoff and rushed to his right, then stopped and threw back to his left to a wide open Chelf. The quarterback ran it 48 yards to the Baylor 5 yard line. Two plays later, Staley scored his second touchdown of the day to increase their lead to 28-3. The Bears continued to struggle offensively on their next three possessions. On the first possession after the touchdown, Linwood fumbled for the second time and linebacker Caleb Lavey recovered for the Cowboys. On their next possession, Baylor went for it on 4th and 9 from the Oklahoma State 45 yard line. Petty’s pass to Antwan Goodley fell incomplete. On their last possession of the 3rd quarter, Petty ran the ball on 4th and 10 from the Cowboys 40, but was stopped short. After the last turnover on downs, the Cowboys increased their lead to 35-3. Jeremy Smith ran for 29 yards and then Charlie Moore hit Tracy Moore on a reverse pass for 22 yards to give them the ball at the Baylor 4 yard line. From there, Chelf ran it in for the touchdown. On Baylor’s first possession of the 4th quarter, they finally got some momentum. Petty hit Antwan Goodley for a 24 yard touchdown pass to cut the lead to 35-10. After forcing a Cowboys punt, the Bears again moved the ball into scoring position. The Cowboys put the game out of reach when corner Tyler Patmon recovered a fumbled snap and raced 78 yards for a touchdown and a 42-10 lead. Midway through the 4th quarter, Chelf hit Jhajuan Seales for a 33 yard touchdown to increase the lead to 49-10. Baylor had one last possession and Petty hit Levi Norwood for a 33 yard touchdown to make the final score 49-17. The Oklahoma State defense played very well. The defensive looks they gave Baylor confused them and create havoc. The win gives them the lead in the Big 12. They have one game left on December 7th at home against Oklahoma. A win would make them 11-1 and give them the Big 12 title and guaranteed BCS bowl berth. Baylor had not won in Stillwater since 1939 and they had their worst game of the year, suffering their first loss. Was the bad game because of injuries? The Bears had trouble protected Petty, but none of the injuries were on defense. The Cowboys racked up 594 yards of offense and the Bears corners were torched repeatedly. The loss moves the Bears to second in the Big 12 and ranked #9 in the country. The Bears still have to travel to Ft Worth to play TCU and then finish with a home game against Texas. Clint Chelf, QB, Sr: Has gone from a pocket passer to a dual threat QB, which has made the Cowboys tougher to defend. Reads the defense well. Got into a good rhythm. Showed great touch, putting the ball over linebackers and in front of defensive backs. Has deceptive speed and athleticism. Changed it up this game by attacking with the pass rather than with the run. Completed 19 of 25 for 370 yards and 3 TD. Had 8 carries for -20 yards. Had a 48 yard catch. Desmond Roland, RB, Jr: Hurt his shoulder last week and it could have affected him in this game. He only had 11 carries for 36 yards. Jeremy Smith, RB, Sr: Powerful lower body. Moves the pile. Good breakaway speed. Good vision. Had 12 carries for 71 yards and had a 29 yard run. Kye Staley, FB, Sr: Physical lead blocker. Had his best offensive day of the year, used more as a short yardage runner. Tough inside runner that is a red zone threat. Had 7 carries for 25 yards and 2 TD. Charlie Moore, WR, Sr: Tough. Has great footwork, especially along the sideline. Catches the ball at its highest point. Comes back to the ball well. Had 4 catches for 67 yards and 1 TD. Completed a 22 yard pass. Tracy Moore, WR, Sr: Good combination of size and speed. Competes for the ball. Had 5 catches for 126 yards and 1 TD. Had 56 yard TD catch and a 22 yard catch on a reverse pass. Josh Stewart, WR, Jr: Versatile player that the Cowboys want to get the ball in his hands in a variety of ways. First game back from ankle injury. Able to return punts. Had 5 catches for 45 yards. Completed a 48 yard pass. Blake Jenkins, C, Jr: Good mobility. Able to get to the second level to block linebackers. Tyler Johnson, DE, Sr: Quick first step. Good awareness. Gets his hands up on the pass rush. Had 3 tackles, 1 QB hurry and 1 batted pass. James Castleman, DT, Jr: Made a great play slapping the ball loose and recovering it at the 1 yard line, preventing a touchdown. Had 2 tackles, 1 forced fumble and 1 recovered fumble. Caleb Lavey, MLB, Sr: Makes plays all over the field. Does a good job ripping the ball out from the ball carrier. Had 2 tackles and 1 forced fumble. Also had his hands on an interception, but dropped it. Tyler Patmon, CB, Sr: Transfer from Kansas. Wraps up well. Comes up quickly on underneath plays. Had a 78 yard scoop and score that iced that clinched the win. Had 6 tackles and 1 tackle for loss. Lyndell Johnson, S, Jr: Knows how to get into throwing lanes. Does a good job reading the quarterback’s eyes. Had two tackles, one which stopped a 4th down conversion. Also had a pass breakup on a 4th down. Daytawion Lowe, S, Sr: Known as a stout run defender, but he showed good skill as a pass defender. Plays great in the box. Had 10 tackles and 1 pass breakup on 3rd down which forced a punt. Bryce Petty, QB, Jr: Kansas transfer. Has great command of the offense. Able to move the chains with his feet. Keeps plays alive. Was under pressure all day. Completed 28 of 48 for 359 yards and 2 TD. Had 11 carries for 46 yards and had a 27 yard run. Antwan Goodley, WR, Jr: Short and stocky. Able to line up as a running back. Drives off defenders. Slips tackles. Had 10 catches for 118 yards and 1 TD with a long of 27 yards. Had 3 carries for 6 yards. Levi Norwood, WR, Jr: Has good size. Thrives from the slot. Also plays on the Bears hoops team. Returns kicks. Had 6 catches for 83 yards and 1 TD. Jordan Najvar, TE, Sr: Big size (6-6, 265). Has not been used much in the passing game. Good blocker. Able to line up as a FB. Terrance Lloyd, DE, Sr: Has the size of a linebacker. Had 1 tackle and 1 tackle for loss. Chris McCallister, DE, Sr: Can play in a 2 point stance or with his hand in the dirt. Great pursuit. Had 3 tackles, 2 ½ tackles for loss, ½ sack. Eddie Lackey, LB, Sr: Able to chase sideline to sideline or play downhill. Big hitter. Makes plays all over the field. Had 12 tackles, 1 ½ tackles for loss, ½ sack and a big stop on 4th and 1. Sam Holl, S, Sr: Very good run defender. Plays a hybrid LB/S position. Had 8 tackles, ½ tackle for loss and 1 QB hurry. Demetri Goodson, CB, Sr: Physical. Aggressiveness can at times hurt his team. Beat deep multiple times. Had 3 tackles, 1 pass breakup and had a TD saving tackle in the red zone. K.J. Morton, CB, Sr: Versatile. Good run defender and blitzer. Did not have a very good game in pass coverage. Had 2 tackles, ½ tackle for loss, ½ sack and 1 forced fumble. Joe Williams, CB, Sr: Was beaten deep on a 33 yard touchdown. Had 1 tackle. This entry was posted on November 27, 2013 by draftmaniacs in Scouting reports and tagged 2014 NFL draft, Baylor Bears football, Baylor football, Bryce Petty, Clint Chelf, NFL, NFL Draft, Oklahoma State football.